Stop complaining. Do something. Now. Activity is frenzied at Copiosis HQ. While the team focuses on refining elements of the innovation, promoting our work, and generating awareness, people are asking what they can do right now to support the transition. We’re working on a blog about that. Pending that post, here’s something you can do right now. Visit this website. 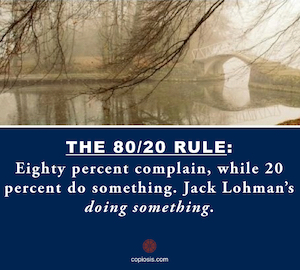 Remember the 80/20 rule? We have our own take on it. Eighty percent are complaining about the status quo. Twenty percent are doing something about it. Meet Jack Lohman. He’s is part of the 20 percent. Jack’s fired up. Jack is about getting real public servants in political power seats. Independents who are focused on solutions to problems instead of perpetuating the status quo. Our solution represents comprehensive systemic change. It’s for the long-term. Jack is attacking the now. He’s all short-term with long-term implications. We’re all for that. He needs your help. You can read his agenda here. We think you’ll be impressed enough to take action & support him. Why support Jack’s work? Like us, he believes nothing good comes from revolution. Especially bloody ones. Power vacuums usually get filled by warlords. When Jack is successful, he will create an environment making Copiosis’ political strategy way easier to accomplish. No social or political collapse needed. Copiosis and Independent Politicians. Both solutions fit nicely. We like synergies. The majority are out there complaining about problems. Few are doing something about it. It’s the 80/20 rule. Jack is the 20 percent getting it done.